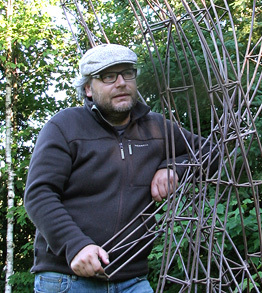 All of my sculptures are designed to one day be carried out on a large scale, in either a natural or urban environment. The small sculptures that are developed during the creative process, like models, continue to live on in private spaces on around me, within reach. On a daily basis, they remind me of the emotion or feeling at the origin of each sculpture. Almost all my works are made up of several elements. Sometimes free and independent, they come together to give birth to the sculpture. Others can be moveable, rocking back and forth in a slow, continuous rhythm or capable of assuming different positions and/or having different ways that they can be assembled, like L'Oxalis IV. The base – most often a natural element, like a rock found randomly during a walk – is an integral part of the work. It is at the center of the various elements of the sculpture, which can be quite different depending on the chosen angle of view. From a more general point of view, the way my sculptures hold together raised the question, from the very beginning, of the best way to stand them on the ground. This is an important question, which led me early on to abandon the pedestal. My sculptures, accessible, are therefore positioned directly on the ground, finding their balance on a few points or edges, which gives their silhouettes a certain grace and lightness. Finally, because I have to consider all of these different factors, the conception of a sculpture requires a lot of patience on my part. The preparation can take several weeks or even several years, sometimes with the fear of it all leading to nothing, given the complexity of the pieces, which explains the multiple dates given in some of the photo captions. But I always find a solution by making other drawings, and especially by using a three-dimensional "drawing": the framework. The result is, to my great satisfaction, often better than what I expected. That fact gives me immense joy and the desire and courage to begin all over again. I often find myself re-working my sculptures several years later, as if to remind myself that the process of creation is fascinating and never ending.